Jo Sung Gon pulled off a remarkable feat at Busan Racecourse this afternoon, winning 6 of the 11 races – including 5 in a row – all for 6 different trainers and with only one slight odds-on chance among them. Jo won Race 1 on Namdoui Yeowang, but didn’t strike at all between races 2 and 6, during which time Kim Yong Geun rode a treble of his own. From race 7 on, however, there was no stopping him as he won all of the remaining 5 races on the card. Pick of the winners was in the class 1 feature where he guided the Peter Wolsley trained Ghost Whisper to a comfortable victory. It was the 14th win of the 6-year-old gelding’s career. 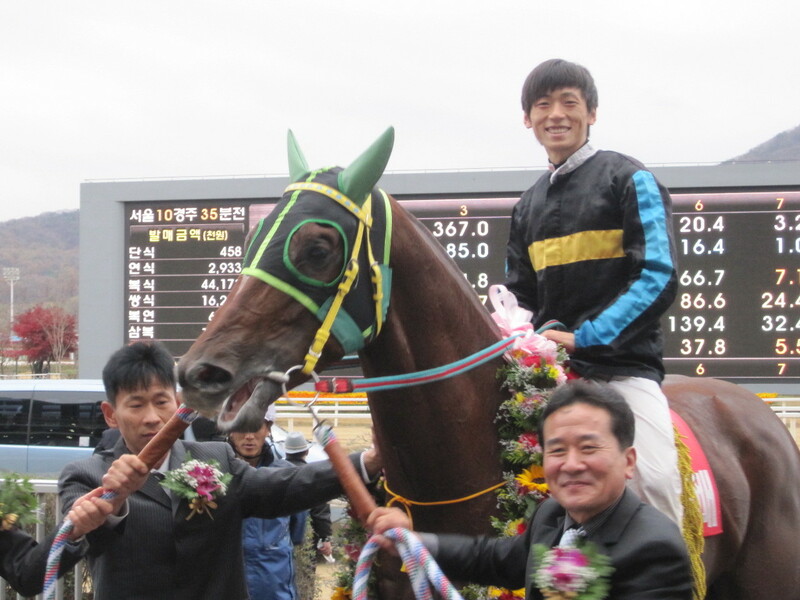 Busan’s reigning champion jockey, the 32-year-old Jo Sung Gon isn’t going to win the title this year. The main reason for this was that he gave his rivals a head start by spending the first three months of the season riding in Macau. Since his return, he has ridden 58 winners and lies 4th in the standings. Best known among casual racing fans as being the regular jockey for Dangdae Bulpae (seen in the picture above) on whom he won an unprecedented 9 stakes races, he also has a Korean Derby and Oaks to his name and alongside Moon Se Young at Seoul, is widely considered as one of the top two jockeys in Korea.